Vanna, who announced their breakup earlier this year, have revealed the details of their final show. See the band's last-ever run of tour dates, culminating in a closing hometown gig, along with their initial breakup statement below. Vanna's final performance ever will take place at The Palladium in Worcester, Massachusetts, on December 15. The last show will be preceded by a brief run of dates this August featuring fellow rockers Phineas and Ghost Key. 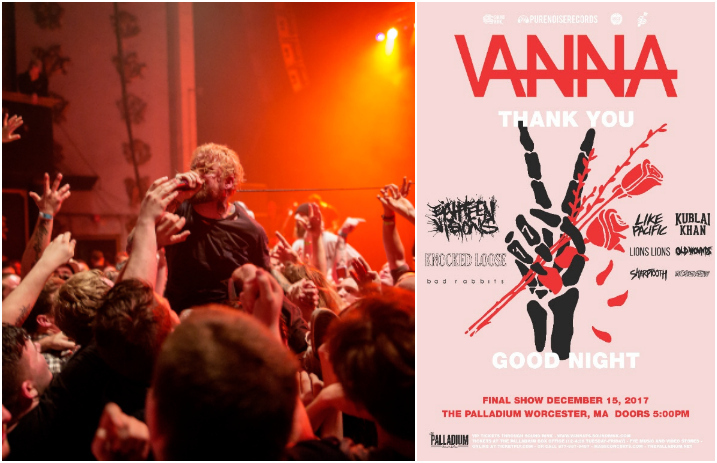 The final show at The Palladium will feature a jam-packed lineup of bands backing Vanna: Eighteen Visions, Knocked Loose, Bad Rabbit, Like Pacific, Kublai Khan, Lions Lions, Old Wounds, Sharptooth and Roseview. Pre-sale and VIP tickets go on sale today, July 18, right here, with regular on-sale set for July 21. “We've had this day in the back of our minds since we started,” Vanna frontman Davey Muise says. “None of us could have known that day would be well over a decade later. One thing we always knew though was we want to go out the same way we came in and the same way we've always done it — surrounded by love from all the bands, friends, family, and fans we can squeeze into a room. That day has finally come for us. “Our band has always strived to take the negative in our lives and use it to fuel positive change. To foster good in a world that can be so bad. That and to cause the biggest ruckus with our fans while doing so. The relationship we share with you all and with our music has brought us to places we never dreamed of going; countries we never thought we'd step foot on, stages we only dreamed of playing. But the biggest impression left is the overwhelming sense of family that this scene has given us and let us be a part of. It's helped us become the men we are today and, in a way, is partly responsible for different parts of our lives blossoming. “After touring for over 10 years, living our lives on the road and on the stage, it's time for us to go chase those other dreams that may have waited on a shelf. We've started families, careers, and new lives, all the while spending our nights sweating in a club or a Warped Tour parking lot with you and those sides of us and our lives need attention as much as Vanna did. “Words can't begin to express what you have all done for us. In keeping with always sharing ourselves with you, we now turn to you to share one last time with us. Let's make this tour a celebration of every moment and memory as well as make a bunch of new ones with some amazing friends and bands. “Come sing your hearts out and inevitably cry your eyes out with us as we leave a little piece of Vanna on every stage. This isn't goodbye forever — it's just a 'We'll see you around.' Our music will be here whenever you need it; we truly love you and we will miss you all. But remember, all good things must come to an end, but all good things can begin again.